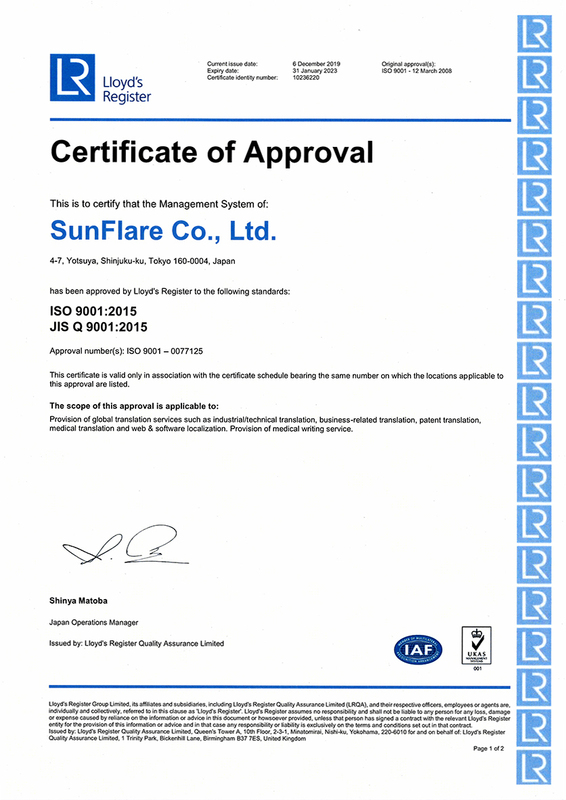 Research and Consultation - Services - SunFlare Co., Ltd.
To help our clients develop their businesses, we employ specialists in the relevant industry or field to carry out searches and provide consultation services in areas such as intellectual property strategies, overseas expansion, and new market entry. We pay careful attention to the details of our clients' requests for patent searches to ensure that we can devise the optimal search plan based on a firm understanding of their aims and needs. Our patent translators translate the key content that has been extracted via the screening process. As a result, there is no need for you to have the search and translation processes handled by two different companies. 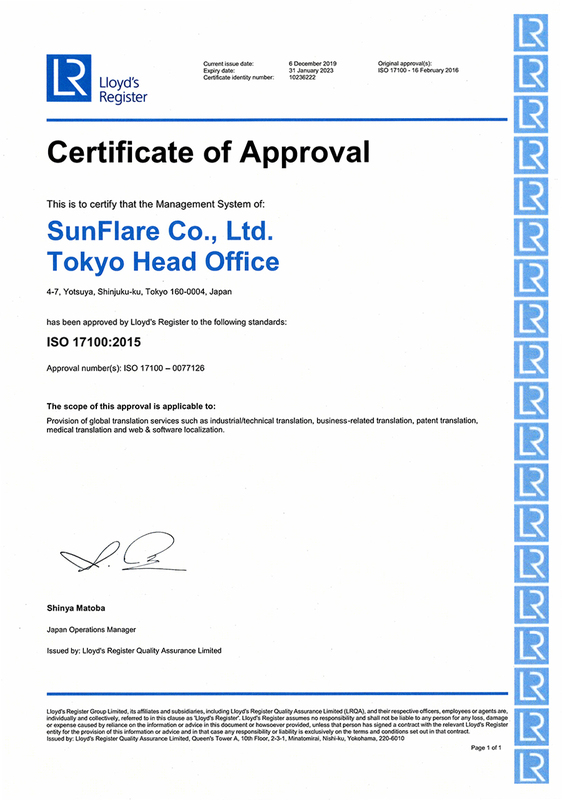 All of SunFlare's searchers have experience in corporate intellectual property research and development and have worked in patent offices or patent search firms. We also have staff with patent attorney qualifications, search technology qualifications and engineering qualifications. We cover a diverse range of fields, including chemicals, biotechnology, medical and electrical devices, electronics and controls. With society continuing to age and demand from developing nations increasing, the global market for medical devices is expected to grow ever larger. Small and medium-sized enterprises that carry out the underlying manufacturing operations for medical devices can rely on SunFlare to support them in ensuring regulatory compliance through our domestic and international pharmaceutical affairs consultation services. ● Consultation services related to domestic regulatory affairs and establishing systems for manufacturing and sales authorization, etc. 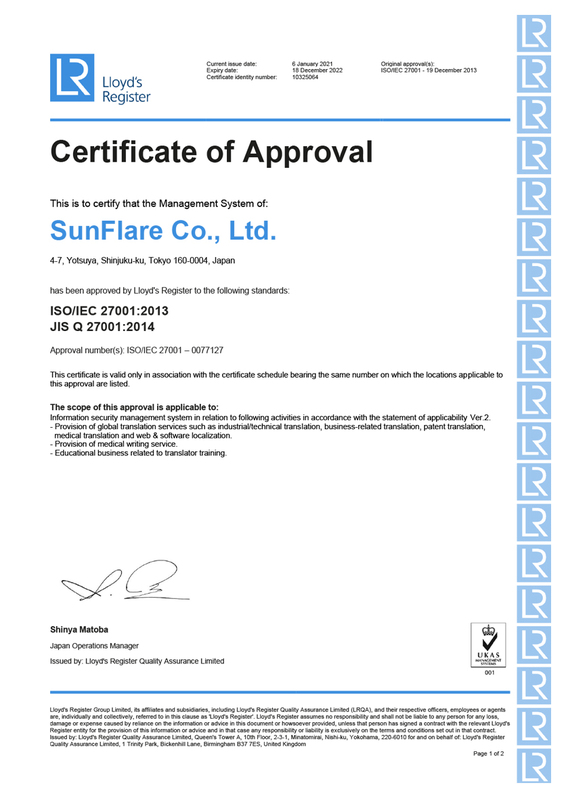 *The above consultation services include detailed document organization and specification compliance work. Having experienced remarkable growth in recent years, China's enormous market offers a large number of business opportunities. We provide support to clients aiming to do business in China. Our unique network of contacts helps ensure a successful outcome for businesses who wish to expand into the Chinese market in the near future as well as those already established there. For businesses wishing to establish themselves in China, it is essential that they have a sound knowledge of China's laws and regulations, which can differ dramatically from Japan's, stay up to date on new laws and have a good understanding of the distribution market there. Given our strong network of contacts with our local partners, we can offer comprehensive support for fields such as intellectual properties, medicine and compliance. If you have concerns about why your products are not selling as well as you had hoped, have doubts about whether you are doing things correctly or are unsure about how to proceed despite having a good understanding of what is required, we can develop plans that are tailored to your goals, including in terms of corporate branding or sales promotion. For instance, we can produce appealing advertising copy or designs to promote your products by maintaining regular communication with you from the planning stage to ensure the creation of optimal Chinese translations and other materials.